It’s not just S4C that is threatened by potential changes. It is television for Wales as a whole, if the latest BBC Wales Annual Review 2014-15 by Audience Council Wales is anything to go by. This Review, for 2014 – 15, makes alarming reading, particularly as it comes hot on the heels of Ofcom’s recent special additional report on PSB in the internet age: The Nations of the UK and their regions and the bombshell about funding burdens for the BBC lobbed by the Chancellor while no one was looking. It appears the day before the Green Paper on BBC Charter Renewal is expected but it shouldn’t get lost in the sturm und drang that that is likely to produce because it has significant things to say about television in Wales. Audience Councils advise the BBC Trust on how well the BBC is fulfilling its Public Purposes. There is no mistaking the warning running throughout this Review. It is at its starkest when it deals with the first of two Priorities it set last year: The Importance of English language TV from Wales for Wales. This year the Council offers us an image from nightmare – we’re teetering on the edge of an abyss and that’s a pretty tough trough to climb out of. 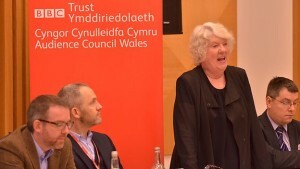 The Council remains concerned however at the lack of the portrayal of Wales on UK-wide BBC TV with 7 years having now passed since the last major portrayal of Wales in UK drama through Gavin and Stacey and Torchwood. This is a crucial point – the proportion in which Wales makes tv for itself and for the network. It always has been. But in some people’s minds the welcome success of the network dramas obscures the paucity of drama portraying Wales itself. Wales should be doing both. Read the Report. And if you’re passionate about a healthy future for S4C be passionate about a healthy future for television in English for Wales. These are not two separate issues. Remember the iconic Welsh history series ‘The Dragon Has Two Tongues’? That was made by HTV Wales and Channel 4. ITV Wales had its first network commission in 25 years last autumn. Let’s have more. Well, the dragon is on the cliff-edge. We should commit to speaking with both languages in mind whenever we discuss television in Wales. Never one without the other. Campaigning for Welsh-language tv has to mean campaigning for English-language tv.